Is he right? Are they “almost visionary”? Are they really fully capable of being implemented? What are the chances that they actually will be implemented as intended? 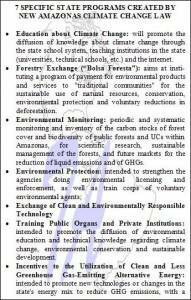 The “State Law on Climate Change, Environmental Conservation and Sustainable Development” sets up seven special state programs, including the “Forestry Exchange” (Bolsa Floresta) and those on environmental education and training linked to climate change, monitoring and enforcement, technology transfer, and the promotion of alternative energy that emits fewer greenhouse gases (GHG), especially biodiesel (click on chart for a larger view of the summary of programs). 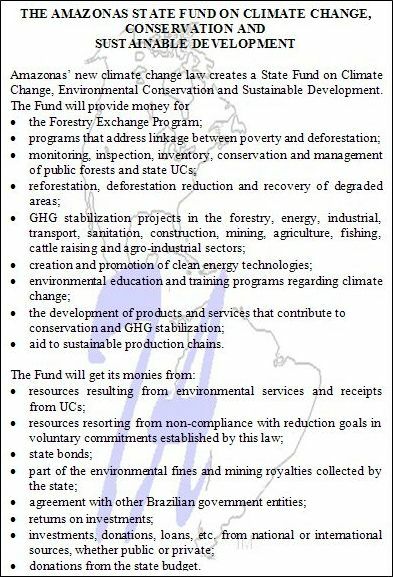 The climate change law also creates a special Fund to support some of those programs, as well as afforestation and reforestation programs, projects to recover degraded lands, and GHG stabilization projects for agriculture, agro-industrial, cattle raising, construction, energy, fishery, forestry, industrial, mining, sanitation and transport sectors. The Fund will be fed not only by state bonds, state grants and donations, loans, and investments from within Brazil and abroad (public or private), but also from environmental fines, mining royalties and unspecified “receipts” and “resources” arising from environmental services started in the state UCs. Click on the box at right in order to view a larger version of a summary I composed on the Fund. authorizes the state executive to concede tax benefits relating to the sales tax (Impostos Sobre Circulação de Mercadorias e Prestação de Serviços – ICMS) for (a) biodigestors that reduce GHG emissions; (b) inputs to biodiesel production; (c) energy generation from trash incineration; (d) ecotourism ventures that include environmental education elements about climate change in their activities. creates two special seals — one for people, entities and communities within Amazonas and other other for those located and primarily operating outside the state — awarded to those that contribute to the special Fund. The law on state UCs not only sets state norms for the creation, implantation and management of UCs, but also fleshes out the aforementioned “Forestry Exchange” (Bolsa Floresta), which among other things will make a monthly payment to the 8,500 families registered as living in the state’s 33 UCs. The 33 UCs cover an area of 17 million hectares. The aim of the payments is to make the families into forest guardians. Comprehensive? Definitely. Bold? Ambitious? Certainly — perhaps too much so (more on that in a minute). The use of environmental services to combat deforestation? Actually, Costa Rica has been doing that for years now, and several recent projects in Colombia have featured it. Seeking CDM status (and thus carbon financing) for programs of “avoided deforestation”? Well, yes, the concept is cutting edge and been tried before in only a few places, including Colombia. The Fund? Perhaps. 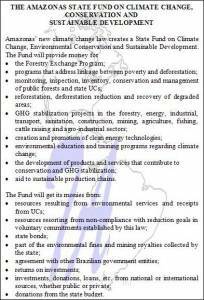 The possible funding sources for it are interesting, as are some of the target uses (reforestation, recovery of degraded lands, sectoral GHG stabilization projects, etc.). How visionary it will turn out to be, though, will depend on its implementing regulation and the guidance of its governing board. Tax credits? Well, not visionary at all if applied to biodiesel and incineration. The former shouldn’t need additional help/subsidies in the Brazilian context, and I am concerned that this tax break might just be used to promote palm oil (dendê) plantations. As for trash incineration, I generally question tax breaks for this form of trash disposal in any jurisdiction, and wonder how this process is considered to be reducing GHG emissions or deforestation (the purported raison d’etre of the Fund). Tax breaks for methane-trapping biodigestors? Might be a sensible idea, particularly on the state’s agricultural lands. Tax breaks for ecotourism ventures that educate about climate change? An interesting concept, but the devil will be in the implementing details. How will they determine what qualifies as “ecotourism” when experts disagree, and what will qualify as an acceptable form and level of environmental education about climate change? Lines of credit for “sustainable production chains”? Well, special credit is a traditional policy tool. How visionary the “chains” prove to be will depend on how they are defined in practice. “Fully Capable of Being Implemented”? Capable of being implemented? In theory, perhaps. In practice, I am not so certain. The law has such a complex mix of ideas that it is almost scattershot, unfocused. This leads to the second point: Amazonas does not yet have the institutional infrastructure to fully realize these two laws. I dare say that even the most experienced, best equipped and technically savvy state environment bureaucracy in Brazil would have a difficult time implementing this bold and complex climate change law fully, well and in a timely fashion — and Amazonas is far from being that aforementioned state bureaucracy. It will take a lot of expert assistance from federal agencies, international aid agencies (World Bank, IDB, GTZ, etc. 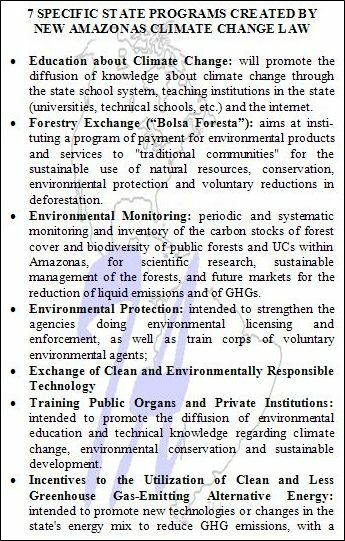 ), research institutions (such as Imazon) and nongovernmental organizations (WWF, Greenpeace, Conservation International, etc.) to pull it off. Third, there is an enormous amount of detail left to be fleshed out in implementing decrees, regulations and portarias. 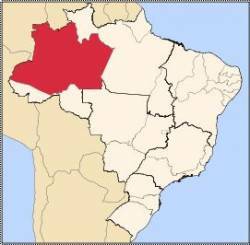 Unless Amazonas proves quicker and more adept at such rule-making than other states, this implementing process will be slow. 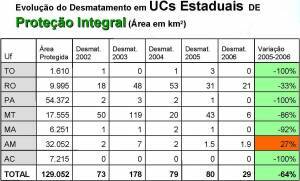 Unfortunately, Amazonas is one of the few Brazilian states where deforestation currently is on the upswing, both within and outside the state UCs, so the state can ill-afford delays. Don’t get me wrong, though. I applaud Amazonas for taking the lead among Brazilian states in setting out a comprehensive climate change policy framework, and hope that other states (and indeed the national Congress) are inspired to adopt and implement their own comprehensive frameworks. And I admire that they chose to be bold rather than half-hearted, even if they cannot pull off everything they have envisioned. Doubtless others will study the Amazonas legislation and model theirs after all or part of it — more likely part, since being first means (hopefully) that others learn from any conceptual and drafting mistakes the leader made. I just hope that they will receive all the help they’ll need to fully and successfully realize the potential of the framework. I would hate to have it become another case (there are many in LAC) of a nicely written law that bears little resemblance to the actual situation on the ground. O governo estadual sancionou nesta terça-feira (5), Dia Mundial do Meio Ambiente, duas novas leis com o objetivo de fortalecer e incentivar o desenvolvimento sustentável da floresta amazônica, além de minimizar os problemas causados a esse ecossistema pelo efeito estufa e pelo desmatamento. A Lei Estadual de Mudanças Climáticas, Conservação Ambiental e Desenvolvimento Sustentável do Amazonas e a lei que cria o Sistema Estadual de Unidades de Conservação começam a valer nesta semana, incluindo a criação do primeiro fundo estadual de mudanças climáticas do país, além de produtos e serviços florestais. A lei também cria o Bolsa-Floresta, benefício que será pago mensalmente às 8,5 mil famílias que vivem nas 33 unidades de conservação ambiental do estado, cadastradas pela secretaria estadual de Meio Ambiente. Essas unidades ocupam uma área de 17 milhões de hectares e segundo o secretário Virgílio Viana, o objetivo é fazer do homem do interior um verdadeiro “guardião da floresta”. A lei de mudanças climáticas atuará ainda para dar às empresas que atuam na região a oportunidade de reduzirem as emissões de gases. Com o Sistema Estadual de Unidades de Conservação, acrescentou, o governo estabelece as normas de criação, implantação e gestão das unidades de conservação no estado. O governador Eduardo Braga disse que as duas novas leis contribuem para a defesa da floresta, mas que ainda existem desafios e o maior deles é o desenvolvimento com sustentabilidade ambiental. “Por falta de arranjos produtivos sustentáveis, tecnologia, logística e financiamento, determinadas populações acabam se utlizando de forma indevida da floresta. É fundamental dar ao valor econômico um aspecto social, sob pena de não democratizar isso para as populações locais e deixá-las excluídas do processo de desenvolvimento sustentável. Precisamos também entender os limites ambientais, que devem ser respeitados, como a exploração racional dos recursos. Por fim, não podemos ignorar a importância da tecnologia, porque sem GPS, sem cobertura por satélites, não seria possível vencer os desafios da relação homem-natureza”, afirmou. Apesar dos protestos contra a divisão do Instituto Brasileiro dos Recursos Naturais Renováveis (Ibama), os funcionários do órgão apoiaram a sanção das novas leis, que segundo o analista ambiental Marcelo Dura contribuem para o enriquecimento do debate na região. “Ganha a população que vive na floresta e ganha o meio ambiente de uma forma geral”, disse. Para o coordenador do Greenpeace no Amazonas, Paulo Adário, “as duas leis são quase ‘visionárias’, mas perfeitamente capazes de ser implementadas”. Ele acrescentou que a iniciativa “mostra que é possível e necessário fazer alguma coisa para preservar a floresta em pé e proporcionar melhores condições de vida ao homem que vive distante dos centros urbanos”. O estado possui 33% da área total da Amazônia e a floresta abriga a maior diversidade de plantas e peixes do mundo, além de 16% de toda a água doce do planeta.